Background: Conventional radiographs are not an efficient diagnostic imaging modality to detect vertical root fracture. Cone-beam computed tomography (CBCT) is a three-dimensional imaging modality that overcomes the limitations of conventional radiography in the detection of vertical root fractures (VRFS), although metallic structures produce artifacts in the produced images and since most of the teeth with VRF are endodontically treated and have metallic posts in root canal so fracture detection may be difficult. Aim: This study aimed to determine the diagnostic accuracy of CBCT using metal artifact reduction algorithm in detection of VRF of teeth with metallic posts compared to digital intraoral radiography. Materials and Methods: One hundred and twenty single-rooted extracted human teeth were endodontically treated then placed in an acrylic block and metallic posts were inserted. The teeth roots were divided into two groups; one with induced VRF and the other having intact roots. Then, each tooth was coded and imaged three times using CBCT with and without metal artifact reduction algorithm and digital periapical radiography. Data were collected and statistically analyzed. Results: Digital periapical radiography showed statistically significantly lower diagnostic accuracy than CBCT modalities (P ≤ 0.05). The use of metal artifact reduction algorithm improved the diagnostic accuracy from CBCT1 to CBCT2 but with no statistically significant difference (P ≥ 0.05). Conclusion: From the study, we can conclude that in case of presence of metallic posts, CBCT with metal artifact reduction algorithm can improve detection of VRF. Vertical root fracture (VRF) extends vertically from root apex to the tooth crown, according to the American Association of Endodontists. It occurs mainly due to excessive canal shaping, pressure during gutta-percha compaction and pressure during postplacement. Radiographically, the fractures seen as radiolucent lines between the fractured fragments and discontinuity of the periodontal ligament. Cone-beam computed tomography nowadays used for the diagnosis of root fractures to remove anatomic superimpositions and allows three-dimensional (3D) visualization of maxillofacial skeleton, the teeth, and their surrounding structures with high spatial resolution., Recent studies demonstrated the advantages of CBCT in detecting root fractures, although there are some limitations when imaging dense materials as gutta-percha and metallic posts. These materials usually cause metal artifacts that affect the quality of images. Recent CBCT machines can apply metal artifact reduction algorithms that may be effective in reducing metallic posts artifacts which will provide 3D-CBCT images with metallic artifacts reduction and thus allow for better diagnosis of root fractures in teeth with metallic posts. Artifact reduction algorithm in Master 3D machine (Vatech, Hwaseong, South Korea) increases the contrast-to-noise ratio in produced images. This aim of this in vitro study was to assess the accuracy of CBCT versus intraoral digital periapical radiography in detection of root fractures of teeth with metallic post. Our study is a cross-sectional prospective (data collection was planned before the index test and reference standard test were performed) study with a blind comparison to a gold standard. Ethics committee approval no: 12502/2015. Study protocol number:Rad/305349/2015. One hundred and twenty freshly extracted human single-rooted teeth were obtained from the outpatient clinic of Oral Surgery Department, Faculty of Dentistry of Misr International University and stored in 10% formalin to preserve hard tissues. All teeth included in our study were endodontically treated then the gutta-percha in the cervical part of the root was removed using gates glidden drills. The roots of teeth were covered by wax to simulate the periodontal ligament resiliency. A rectangular acrylic block was prepared in a rectangular plastic box with sufficient height to hold teeth in a position simulating patient radiographic imaging. Then, eight holes were made in each block to support the teeth included in the study. Each eight teeth were embedded in each acrylic block with their palatal surfaces directed outside toward the block borders. Group two: The teeth having intact roots (sound) with the posts inserted. Using digital intraoral radiography, the exposure was made with an image for each two teeth using an intra-oral X-ray machine (X-mind, Acteon, Satelec, France) with paralleling technique using a paralleling device and an intraoral imaging plate size 2 of the digital system (Vistascan Durr Dental, Germany). The following exposure parameters, 70 kVp and 8 mA, were used. The images were evaluated using (DBSWIN) software to detect root fracture [Figure 1]. Each block was sectioned into two halves each containing four teeth to be adjusted to the CBCT field of view. The teeth were imaged using CBCT machine (Scanora3D, Soredex, Finland) after adjusting the control panel for image capturing without metal artifact reduction algorithm. Parameters were adjusted at KVp = 90, mA = 10, Voxel size = 85 μm, FOV = 5 cm × 5 cm, and exposure time = 6.1 s.
The exposure parameters used were the same as the second protocol but with metal artifact reduction algorithm adjusted using the SMAR™ control panel before the scan. 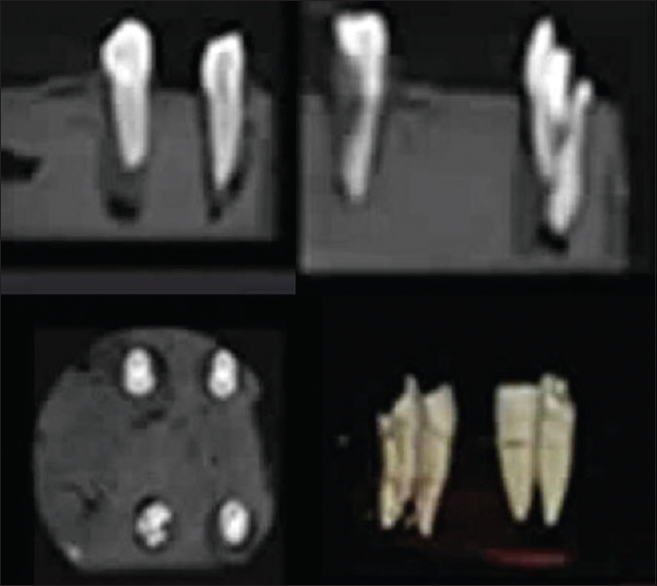 The CBCT images were analyzed using (On Demand 3D) software viewer in axial, coronal, sagittal, and 3D views to detect the presence or absence of root fracture [Figure 2]. The outcome was binary for the presence or absence of fracture lines. All images were evaluated for presence or absence of root fractures by two radiologists of an experience of 10–25 years. The two radiologists were blinded during periapical radiographs, and CBCT images assessment as tooth preparation and coding was done by a third researcher. Moreover, the statistician was blinded too. Data were presented as frequencies and percentages. Receiver operating characteristic (ROC) curve was constructed to evaluate diagnostic accuracy for all modalities. Areas under the ROC curve for all modalities were compared using z-statistic. Positive and negative predictive values, diagnostic accuracy, and sensitivity and specificity measures were calculated. The significance level was set at P ≤ 0.05. ROC curve analysis was performed with MedCalc Version 11.3 for Windows (MedCalc Software bvba). 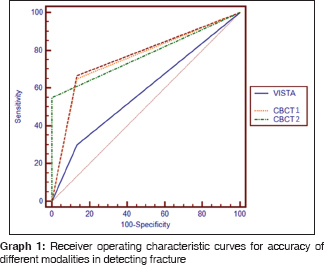 Frequencies and percentages of fracture detection by different modalities were calculated [Table 1]. The highest sensitivity was found with CBCT1 (65%). The lowest sensitivity was found with digital periapical radiography (30%) [Table 2]. The highest specificity was found with CBCT2 (100%). CBCT1 and digital periapical radiography showed lower and equal specificity values (86.7%) [Table 2]. The highest positive predictive value was found with CBCT2 (100%) followed by CBCT1 (83%). The lowest positive predictive value was found with digital periapical radiography (69.2%) [Table 2]. In contrast, the highest negative predictive value was found with CBCT1 (71.2%) followed by CBCT2 (69%). The lowest negative predictive value was found with digital periapical radiography (55.3%) [Table 2]. Pair-wise comparison between areas under the ROC curve [Graph 1)]for different modalities revealed that digital periapical radiography showed statistically significantly lower diagnostic accuracy than CBCT1 and CBCT2 (P ≤ 0.05). ROC curve analysis revealed that the highest diagnostic accuracy was found with CBCT2 (77.5%) and CBCT1 (75.9%). The lowest diagnostic accuracy was found with digital periapical radiography (58.4%) [Table 2]. The use of metal artifact reduction algorithm improved the diagnostic accuracy from CBCT1 to CBCT2 but with no statistically significant difference (P ≥ 0.05) [Table 2]. The accuracy of diagnosing VRF requires careful clinical examination and an imaging modality which assesses the integrity of the bone and dental structure. Intraoral digital imaging has lower radiation doses than conventional systems and offers more advantages such as image enhancement and storage; therefore, during radiographic examinations for the investigation of root fractures, it is advisable to use this imaging method. da Silveira et al. confirmed the advantages of CBCT in detecting VRF over periapical radiography and found that CBCT shows better results. Detection of VRF is influenced by imaging examination and also by the presence of material in the root canal, such as metallic posts and root canal filling material. The findings of the current study were similar to da Silveira et al. Shaker et al. methodology were followed in the present study. The voxel size was not changed during the experiment of the present study. According to Mello et al. using different voxel sizes during examination will results in different diagnostic abilities for simulated VRF. Paralleling technique was used in periapical radiography to adjust the beam direction perpendicular to the tooth surface using paralleling film holder and teeth that were placed in the acrylic blocks with their buccal surface directed toward the beam to simulate clinical condition. This is very helpful when there is no superimposition of other adjacent structures, hard tissues, or radiopaque root canal materials., Therefore, the use of different angulations might not help in detecting the fracture using the two-dimensional radiographic technique. To avoid the superimposition of other endodontically treated roots, only single-rooted teeth were used. Induced VRF was created by applying excessive forces to the roots through excessive rotation of posts to try to mimic the shape of fracture line in clinical situation. This is different than da Silveira et al., who inserted a tapered chisel in the canal space then gently tapped it with a hammer to induce a VRF. Such a technique might split the tooth into two resulting in widening the VRF which make it easy to be detected with conventional as well as CBCT radiography. ROC curves used in this study was used previously by Mora et al. This curve was reported to plays a central role in evaluating diagnostic ability of tests to compare two alternative diagnostic tasks when each task is performed on the same subject. Our results showed that the highest diagnostic accuracy was found with CBCT2 and the lowest diagnostic accuracy was found with digital periapical radiograph. This result is in agreement with the results of Varshosaz et al. and Hassan et al. In accordance with Varshosaz et al. and da Silveira et al., the results showed reduced sensitivity of periapical radiography than CBCT in the presence of metallic post. This can be attributed to the difficulty of detecting vertical fracture line on periapical radiographs when the X-ray beam is not parallel to the fracture line, especially when the fracture is a crack without fragments detachment. Using the metal artifact reduction algorithm improved the diagnostic accuracy from CBCT1 to CBCT2. It is similar to the findings of Tofangchiha et al. This could be attributed to the fact that dense materials show beam hardening and streaking artifacts resulting in poor images for diagnostic purposes. On the contrary, Bechara et al. reported lowered accuracy while using metal artifact reduction algorithm. This can be explained by their usage of phantoms in their study, as the influence of the metal artifact tool depends on clinical condition simulation and artifact-inducing material used. CBCT with metal artifact reduction showed lower sensitivity than CBCT without artifact reduction and this is attributed to that artifact reduction algorithm is used depending on a threshold. Structure with density higher than the threshold will be corrected and attenuation from high-density materials removed as well, which may decrease the ability to confirm presence of fracture (true positive fracture). More studies are required to evaluate the effect of metal artifact reduction algorithm in the presence of more metal artifacts from fillings or metallic crowns that may clinically present covering teeth with metallic posts. In case of clinical suspicious of VRF with negative findings on two-dimensional radiographic examination, CBCT is the imaging modality of choice to confirm presence or absence of fractures. In case of presence of metallic posts, CBCT with metal artifact reduction algorithm can be used to detect VRF to decrease the metal streaking artifacts. Varshosaz M, Tavakoli MA, Mostafavi M, Baghban AA. Comparison of conventional radiography with cone beam computed tomography for detection of vertical root fractures: An in vitro study. J Oral Sci 2010;52:593-7. Cohen S, Berman LH, Blanco L, Bakland L, Kim JS. A demographic analysis of vertical root fractures. J Endod 2006;32:1160-3. Wenzel A, Haiter-Neto F, Frydenberg M, Kirkevang LL. Variable-resolution cone-beam computerized tomography with enhancement filtration compared with intraoral photostimulable phosphor radiography in detection of transverse root fractures in an in vitro model. Oral Surg Oral Med Oral Pathol Oral Radiol Endod 2009;108:939-45. Long H, Zhou Y, Ye N, Liao L, Jian F, Wang Y, et al. Diagnostic accuracy of CBCT for tooth fractures: A meta-analysis. J Dent 2014;42:240-8. Farmakis ET, Konstandinidis C, Damaskos S. Cone beam computed tomography imaging as a diagnostic tool in determining root fracture in endodontically treated teeth. Saudi Endod J 2012;1:22-8. Moudi E, Haghanifar S, Madani Z, Alhavaz A, Bijani A, Bagheri M, et al. Assessment of vertical root fracture using cone-beam computed tomography. Imaging Sci Dent 2014;44:37-41. Bechara B, McMahan CA, Nasseh I, Geha H, Hayek E, Khawam G, et al. Number of basis images effect on detection of root fractures in endodontically treated teeth using a cone beam computed tomography machine: An in vitro study. Oral Surg Oral Med Oral Pathol Oral Radiol 2013;115:676-81. Tang L, Zhou XD, Wang Y, Zhang L, Zheng QH, Huang DM, et al. Detection of vertical root fracture using cone beam computed tomography: Report of two cases. Dent Traumatol 2011;27:484-8.
da Silveira PF, Vizzotto MB, Liedke GS, da Silveira HL, Montagner F, da Silveira HE, et al. Detection of vertical root fractures by conventional radiographic examination and cone beam computed tomography – An in vitro analysis. Dent Traumatol 2013;29:41-6. Shaker IS, Mohamed NS, Abdelsamad AM. Diagnostic accuracy of cone beam computed tomography with and without metal artifact reduction algorithm in detection of vertical root fractures of teeth with metallic posts. J Med, Radiol Pathol Surg 2017;4:9-12. Melo SL, Bortoluzzi EA, Abreu M Jr., Corrêa LR, Corrêa M. Diagnostic ability of a cone-beam computed tomography scan to assess longitudinal root fractures in prosthetically treated teeth. J Endod 2010;36:1879-82. Mora MA, Mol A, Tyndall DA, Rivera EM. In vitro assessment of local computed tomography for the detection of longitudinal tooth fractures. Oral Surg Oral Med Oral Pathol Oral Radiol Endod 2007;103:825-9. Hanley JA, McNeil BJ. A method of comparing the areas under receiver operating characteristic curves derived from the same cases. Radiology 1983;148:839-43. Hassan B, Metska ME, Ozok AR, van der Stelt P, Wesselink PR. Detection of vertical root fractures in endodontically treated teeth by a cone beam computed tomography scan. J Endod 2009;35:719-22. Tofangchiha M, Tavakolian E, Ghaffari P, Jabbarian R. The effect of metal artifacts reduction algorithm on diagnostic accuracy of vertical root fracture by cone beam computed tomography, an in vitro study. Sch J Dent Sci 2017;4:115-20. Bechara BB, Moore WS, McMahan CA, Noujeim M. Metal artefact reduction with cone beam CT: An in vitro study. Dentomaxillofac Radiol 2012;41:248-53.